Evaristo's video for his popular single, "Tumbao con Fe" (Tumbao with Hope) was shot in old Havana by upcoming director, Robin Pedraja, and the best Director of Photography in Cuba, Alejandro Perez. Evaristo's video for his song "Impura" (Impure) from his album, "Siempre que llueve... (After the Rain)" was shot in New York City, directed by Roberto Poveda. 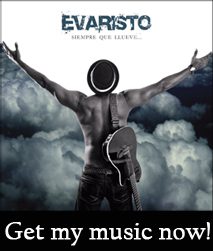 Filmed on location in Havana, Cuba, Evaristo's video features the title song of his album, "Siempre que llueve... (After the Rain)". The song is written by Evaristo and features Cuban rap artist Telmary Diaz. The video was nominated for six of Cuba’s famous ‘Lucas’ Awards, for both Best Video of the Year and Best Music Fusion Video, as well Best Director, Best Art Direction, Best Director of Photography, and best 'Making Of' categories. Click here for more information.